Raimund Huber's latest film is actually a vast improvement over the previous Kill'em All . But this is mainly due to the casting and fight coordination by Kazu Patrick Tang ( District B13, Raging Pheonix, Tom Yum Goong 2) , Kazu has mixed up with the best of them with roles in Ong Bak,CZ12,and Raging Pheonix. Dragonwolf is a story of two child hood friends ( Mozart and Julius) who become two of the most feared gangsters and killers in the underworld, But when a young Mysterious woman appears in their lives and becomes passionately involved with Julius ( Johan Kirsten) she ends up playing into the hands of his partner Mozart ( Kazu) . Julius begins to question the loyalty and friendship of his life long friend Mozart , On top of this there's a third party whose even more powerful then our two friends. A man who would like to see the duo disappear before they get to big for their boots. For most part the film tries to build a story involving the duo with flashbacks of there childhood and more recent times. It also becomes apparent that Mozart is tired of his evil life and comes across as very placid man for most part of the film, whilst some quite over the top acting Julius character is one of arrogance and showmanship ,trying to impress everyone all the time. The film also plays host to one one of the most awful characters on film, with little to know acting talent and featuring in some of the most irritating scenes in the movie , unfortunately this guy who happens to be Julius right hand man crops up a few times and with each appearance he delivers a worse performance then the last. 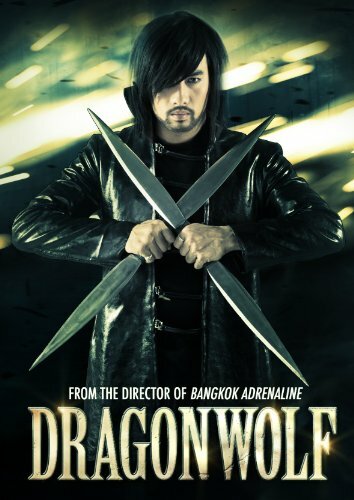 So your thinking why am I watching this, ,well because Dragonwolf plays host to some really good fight action ,even though some of it is edited to fast at points it does deliver when the action kicks in. Dragonwolf won't win any awards ,and after viewing you will wander why KAZU starred in such a vehicle. But then he was the main star and action choreographer , so I suppose most of the budget was spent paying him as I can't see the rest of the cast getting paid more then a couple of quid for their input at times. I don't know why Raimund Huber's films have got worse ,Bangkok Adrenalin while no masterpiece ,delivered a fun action film with a good array of fighting throughout , his latest enterprises have had decent action but only in limited form ,tie this together with a very low budget feel and some pretty bad acting and you have a recipe for disaster . Dragonwolf has problems saved only by the action,with constant flashbacks to the duo's past ,which in turn uncover more characters which either do or do not reappear later on, But for most part these extra characters are just a reason to execute a fight scene. It would have been better to concentrate on the main story about the two factions pitted against each-other by a third party. My advice is to rent or find this in the bargain bin at the local DVD store for under a fiver and you won't go far wrong. In the end without Kazu's input the film would have been a no hoper , with Kazu your find some redemption within it's limits. Review Date : December 22nd 2013. Ong Bak 2 - 2008 - Kazu plays a ninja fighter in Tony Jaa's directorial debut. Raging Phoenix - 2009 - Kazu co-stars with Jeeja Yanin in this good action fest. Bangkok Knockout - 2010 - Kazu has a small role as Doctor Duschanon. CZ12 - 2012 - kAZU plays one of the pirates on the island in Jackie's epic adventure.